If you ask me who is the guy that loves book very much, the answer will be Richard Oh. Four years back he owned a tasteful QB Bookstore, which sadly now it’s closed. My husband and I went to his place several times, and he always welcomed us on his working room, which in my opinion is more of like unorganized library. You can find books everywhere and no place to sit in. I imagine Richard was like Scrooge McDuck, swimming on his pool of coins, but instead of coins, it’s pool of books. 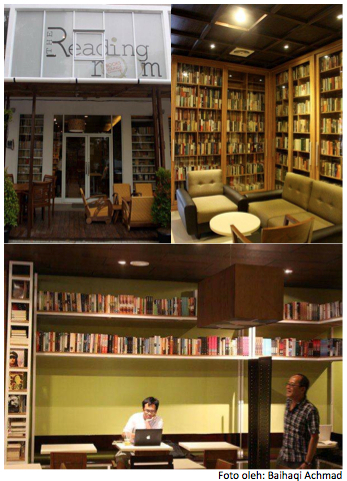 Now, he opens The Reading Room in Kemang, Jakarta. This place is super cozy with calming choice of color concept, the music, the coffee and Wi-Fi. It also has a screening room with 20 seats on it (filmmakers are going to love this place! ), where films can be screened for limited audience. What makes it more special, instead of wall; you’ll find pile of books separate each area of The Reading Room. Most of the books are imported literature. Don’t be surprise if one day you visit The Reading Room and spot your favorite writer working seriously on his computer in a corner. This place is heaven for writer who needs to condition his writing atmosphere. And the good news is; it’s open as early as 9 AM. On the weekend it even opens until 2 AM, while on weekdays it opens until 12 PM. If QB Bookstore was basically a bookstore with a small café on it, The Reading Room is more of a café with tons of books on it. There are more than 5000 books in The Reading Room. Richard’s personal collection is in the 2nd floor, closed in glass cupboards and can only be read there. The book on the cupboard cannot be bought, however if you want, you can buy books outside the cupboard with IDR 50,000-125,000. Visit The Reading Room in Jalan Kemang Timur No. 57A-B, Jakarta.